Earth Day Turns 48... But Will It Turn 100??? We're celebrating another Earth Day, and honestly, as a species, we're running out of time. See what you can do to make a difference and perhaps if we all do our part, there will still be a planet around (worth living on) in 100 years. For 48 years, Earth Day has been bringing communities and organizations together to advocate for a healthier environment and a sustainable life. The first Earth Day on April 22, 1970 activated 20 million people from all walks of life to share their concerns about each citizen’s critical role in the environment. Now over one billion people in 192 countries participate in Earth Day activities, making it the largest civic observance in the world. Today, people everywhere are experiencing first hand the devastating consequences of countries polluting their way to the top. Populations worldwide are in immediate danger, making it more urgent to act than ever before. We must come together and inspire our communities to do their part in securing a healthy and sustainable future for the planet. Organizing an Earth Day event or activity is one of the best ways to engage your community to protect the planet. Talk about Earth Day today with friends, family and strangers. What If Al Gore Is Right??? 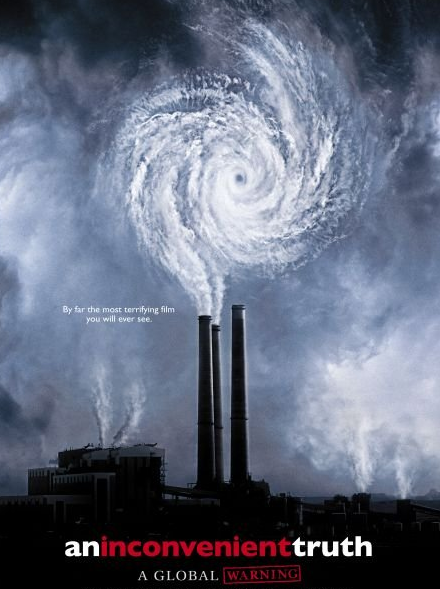 Former US Vice President Al Gore's global warming documentary An Inconvenient Truth identified the issue as a global problem. So are we just waiting out the inevitable? Are humans living on borrowed time? Will humans become the next big species up on the extinction block? Even if Al Gore is only partly right, we should all know a few ways to conserve energy at home, and,with a little extra effort, we could really turn our homes into a GREEN House. For many households energy is wasted and electric bills go up because of one or more inefficient home components (windows, heating and cooling systems, and ducts insulation) or a failure to pay attention to product use directions. A good start is to look at these first for easy fixes, in addition to the following tips. Keep the cold air out. If you already have energy efficient windows (ask your parents if you do), great. If not, increase window energy efficiency by hanging insulating curtains or drapes. Also, you can place a towel along the window ledge in order to keep cold air out. Keep doors and windows closed when using heating or cooling units. Don’t blast the AC or heat. In the summer, try and keep the air conditioning around 78°F when you’re home, 68°F for winter. Each degree of heating or cooling can cost an additional four to five percent in energy costs. Your parents' wallets will thank you. Clean and replace filters. An appliance with filters uses more energy if it's clogged. Get someone who knows what they're doing to check appliances, including heating and cooling systems. Don't forget about your hair dryer. Give your air conditioner a break (or at least turn it down). By creating shade, you can save up to 8 percent of your cooling costs. Use shades, awnings, or sun screens to shade your home and windows. Even a tree or plant can do the trick. Brighten your room with better bulbs. Replace existing incandescent lamps with compact fluorescent lamps (CFLs). These lamps can save three-quarters of the electricity used by incandescents. Don't like the color of CFLs? Buy a paper lamp shade and paint the inside pink with nonflammable pink paint (it will make for softer light). Use dimmer switches, timers, or motion sensors on incandescent lights if you have them. Shop for 'greener' appliances. If you or your parents are in the market for new appliances (such as a new washer or refrigerator), ask them to purchase “Energy Star” products. They’re really efficient and do a great job of saving energy. Is your fridge running too hard? Fresh foods keep at 37 to 42°F, frozen foods at 0 to 5°F. Adjust the temp so it’s not too low. Put your computer on "hibernate" mode. This way, every 30 min that you're away from the computer, it turns off, but not to the point where you have to restart everything once again. Easy. Simple. Energy efficient. Fill the washer or dryer when doing your laundry. Don’t waste energy and water by only washing two pairs of socks when the machine could wash a lot more! Clean the dryer lint trap after each use. It's better for your clothes anyways. Line-dry: Use a clothesline outside or a drying rack inside to air dry your clothes instead of using the dryer. Dishwasher: Wash only full loads. Use the energy saver or air dry cycle. Use the smallest pan necessary when you cook. Smaller pans require less energy. Reduce cooking time by defrosting frozen foods in the refrigerator before cooking. The night before you want to cook something, throw it in the fridge and it'll be ready to go when you are. Avoid excessive peeking into the oven. We know you're super excited about your batch of brownies, but each time the door is opened a significant amount of heat escapes. In winter, open window coverings on sunny days to help warm the rooms. In summer, close them to help keep the room cool during the day. Keep the fridge closed! We know the feeling of wanting something to munch on, opening the door to the fridge and staring off into space mumbling, "There's nothing to eat." That's got to stop. Opening the door wastes a lot of energy and is costly. Speed-shower: The average eight-minute shower uses 17 gallons of water. A family of four could save over 2,300 gallons of water a year by shortening every shower by just 1 minute. Water heater: Ask your parents to lower the water heater temperature. Shower-head: Install a low-flow shower head to save money and water. Cold-wash: Wash your clothes with cold water. It's easier on the fabric and 85 percent of the washing machine's energy goes into heating the water, yikes. Still drinking bottled water at home? Purify your tap water with a water filter and lose the plastic. - By 2030 the number of automobiles in the world will increase by 50%. - According to Chevron, the world consumes two barrels of oil for every barrel discovered. - It took 125 years to consume the first trillion barrels of oil – the world will consume the next trillion in only 30 years, according to Chevron. - By 2030 the world will consume 47% more oil than it did in 2003. - During the last one hundred years the global temperature has warmed between 0.7-1.5°C. - It is predicted that global temperatures in 2100 will be 1.4-5.8°C warmer than they were in 1990. - The current pace of sea-level rise is 50% faster then in the last century. - Scientists estimate the sea level will rise by 3.5-34.6 inches by 2100. - Much of the United States has already warmed, by as much as 4°F. - The five warmest years over last century have likely been: 2005, 1998, 2002, 2003, 2004. - The top 10 warmest years have all occurred since 1990. - Since the beginning of the Industrial Revolution, carbon dioxide (a green house gas linked to climate change) in the atmosphere has increased by 35%. - Diseases such as malaria are predicted to spread as the world grows warmer, due to the carriers of disease spreading out over a larger geographical area. - Of particular concern is the stability of the West Antarctic Ice Sheet. A sudden collapse would raise sea levels 16-20 feet, though the likelihood of such a collapse before the year 2100 is low. - Despite natural emissions of carbon dioxide (CO2) emitted by volcanoes, for example, human activities are now adding about 7 billion metric tons of carbon into the atmosphere every year. - New energy discoveries are mainly occurring in places where resources are difficult to extract-physically, technically, economically, and politically. - Oil production is in decline in 33 of the 48 largest oil producing countries, yet energy demand is increasing around the globe as economies grow and nations develop. - Oil and gas currently provide more than half of the world’s energy supply, and according to the International - Energy Agency, they—along with coal (which also releases CO2)—will continue to be the major sources of energy well into the 21st century unless things are changed. - The International Energy Agency estimates that the world will need to invest $16 trillion over the next three decades to maintain and expand energy supply. - Over half the world’s oil supplies lie in just 5 countries. - Agriculture and biodiversity are already being impacted by global warming. 10% of all known plant species are under threat of extinction. - Over 20 Million Americans, 6.3 million of which are children, suffer from asthma. Public health experts are worries that those numbers will rise with continued greenhouse gas emissions. - People living in cities such as Atlanta, Baltimore, and Cincinnati could by mid-century see a 60% increase in the number of high smog level days. - Diseases such as malaria and West Nile virus will occur in large numbers in the United States as a result of warmer temperatures. - The Arctic ice pack has lost an area about twice the size of Texas since the mid-1970's. largest source after power plants. - Each gallon of gasoline burned creates 20 pounds of CO2. - Vehicles in the United States release more CO2 than all the energy sources (such as heating, electricity, vehicles, and factories) in all of India. - As many as 15-37% of all wildlife species in some regions could be "committed to extinction" by 2050 years because of global climate change. - Salmon, trout, and waterfowl are particularly vulnerable to climate change. - Climate change is having a disastrous effect on coral reefs, including in the Florida Keys, the Bahamas, and Mexico. - Winter temperatures in the Arctic have warmed by as much as 7° F over the last 60 years, a faster rate than in any other region. This affects wildlife such as foxes, caribou, walruses, and polar bears. It also affects the lifestyles of native peoples in the Arctic. - By planting a large tree that creates shade, one can reduce heating and cooling costs annually by up to 40%. Scientific research suggests that there could be another earth-like planet capable of sustaining human life…however, it’s 40,000 light years away. This is not an encouraging Plan B. Be part of the solution...think about what you can do as an individual to help our home planet out in her hour of need. 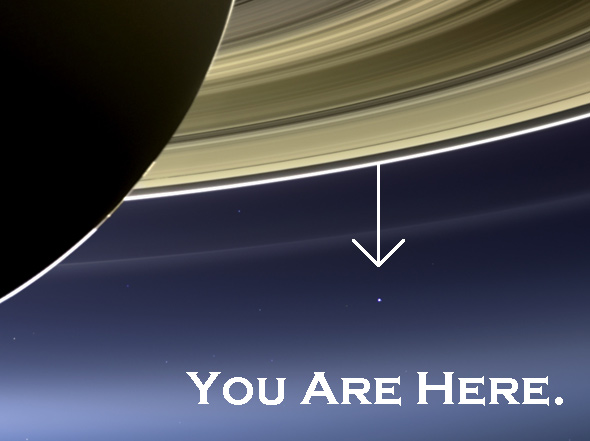 Below: The Earth as seen from Saturn is a reminder: The Universe is big, and we are not. Happy Earth Day!